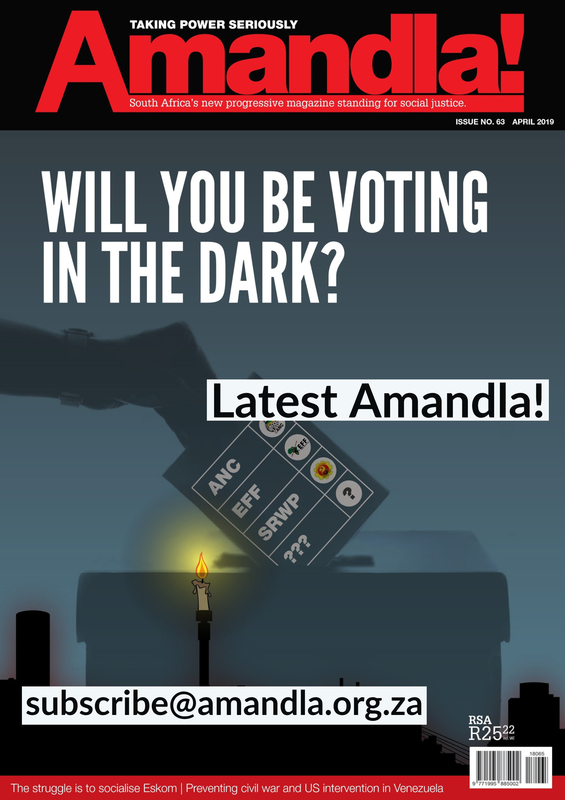 To pose questions about the conditions of labour under South African democracy is to question the success of the ANC’s national project itself. As the liberation party embraced a liberalised economic system, it turned away from the more radical restructuring and redistribution envisaged in the Freedom Charter. This meant that righting the material injustices of the past and re-imagining the basis of social citizenship would not be achieved through the national control and subjection of capital, but through the redemption and universal achievement of waged labour. The super-exploitation of a semi-proletarianised labour force had been the material logic to the old system; the dignifying of work and just reward for productivity was to be the gateway to the new. Labour’s access to the state through the tripartite alliance was to estabish corporatist institutions that would allow conflicts to be managed for the good of the economic whole. But South African corporatism, unlike its ancestors, did not constitute a system of shared compromises from labour and capital on the basis of which a far-sighted state could guide development. Rather, it meant the effective acquiescence of labour to the ANC’s programme of tailoring of South Africa’s dominant capitalists who have become entwined with the party’s top echelons. What was sold as the fruits of cooperation was a set of labour regulations that met the minimum standard of a liberal constitutional state, but was not immune to the devices of informalisation. On macro-economic policy, it is not clear that Cosatu can count a single noteworthy victory. The mistake, if it was a mistake, was to think a globalising South African capitalism had space for a world of work that was dignified and fairly compensated. The system was built for the effective use of cheap labour; historically, it rendered about a third of the population ‘surplus’. Labour received formal protections in the amended Labour Relations and Basic Conditions of Employment Acts, but informalisation undermined secure employment. South Africa’s latest score on the Organisation for Economic Co-operation and Development’s (OECD’s) employment protection index is 1.25, the lowest of all G20 emerging markets and well below the OECD average. As capital structured itself into the world economy – merging, unbundling and financialising – it appropriated the latest techniques of labour management and efficiency, to which these laws presented little obstacle. Labour broking’s R44-billion turnover shows its effectiveness in delivering ‘flexibility’ to employers and in segmenting workplaces. ANC ministers utter strong words against brokers, but their failure to take any concrete action is a sign of workers’ powerlessness in the alliance. Not that a state ban would have brought deliverance. The only real safeguard against capital’s tactics is strong, unified organisation that would probably have to break out of traditional forms from bygone eras. Cosatu, by all appearances, lost the tactical flexibility and militancy needed to respond to these challenges when it allowed its proud heritage of worker control and democracy to wither under a bureaucratic overgrowth. The very logic of supplanting workers’ struggles from the factory floor and the street to the boardroom sapped the basis on which worker control could operate. This orientation prioritised not regular oversight from the rank and file, but full-time officials, effective administrators and those who possessed the back-room skills to thrive in capital’s own corridors. Rewards for those who complied with the taming of labour demands in the name of the popular good were handsome, and were reflected not just in the personal trajectories of heavyweights such as Gwede Mantashe or Thula Nxesi, but at all levels of the bureaucracy to which state resources and positions were made available. Of course, the private sector also gave its enthusiastic support to domesticating a once radical movement and to widening the ‘social distance’ between leaders and the rank and file. The wholesale absorption of NUM structures into the human resources division of Lonmin is the most salient example of this and the most portentous. Though labour’s political sterility is recognised, the union movement retains an image of militancy because of frequent and seemingly severe strikes, which the business media depict as a grave threat to the national interest. So why is the reality of a defanged union movement and institutions that offer little protection for workers so completely at odds with the outlook of business, which regards our labour relations as the worst in the world (according to the World Economic Forum) and rails against excessive regulation and strikes that are ‘bringing the country to a standstill’? The answer is in the continuity of the apartheid-era labour relations in today’s domestic capital. There is no greater register of labour’s defeat over 20 years of democracy than a plot of real wages by percentile. The majority of workers have seen no improvement (or small declines) in their inflation-adjusted wages. 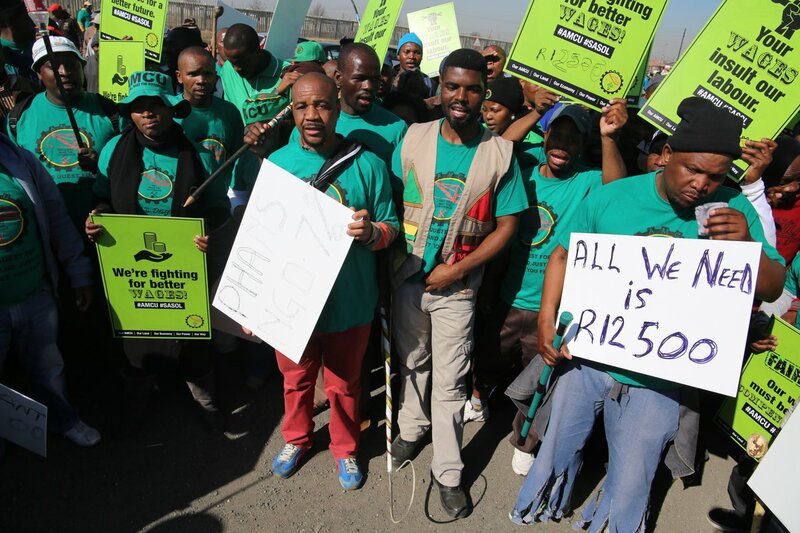 In 1997, half of all workers in the economy earned R3 274 per month (in 2011 prices); in 2011 it was R3 028. Yet the wages of the ‘top 10%’ of workers (‘highly skilled’ professionals and managers) increased substantially, driving up the average. Overall, labour income has lagged far behind productivity. Take out the wages of supervisory workers (that is, bosses), and the working class’s share of value produced in 2007 was 10% less than it was in 1994. The obverse of this was soaring profitability. The past 20 years have been exceptionally good for South Africa’s capitalists. But their good fortune, despite all the promises, hasn’t trickled down to the rest of us. A recent study by Credit Suisse looked at financial returns to shareholders and long-term per-capita growth in various countries, finding that the two are negatively correlated. South Africa had the widest discrepancy between what shareholders got and how much the economy grew. The unemployment crisis is not the result of the power of organised labour, but the fruit of the increased power of organised capital. 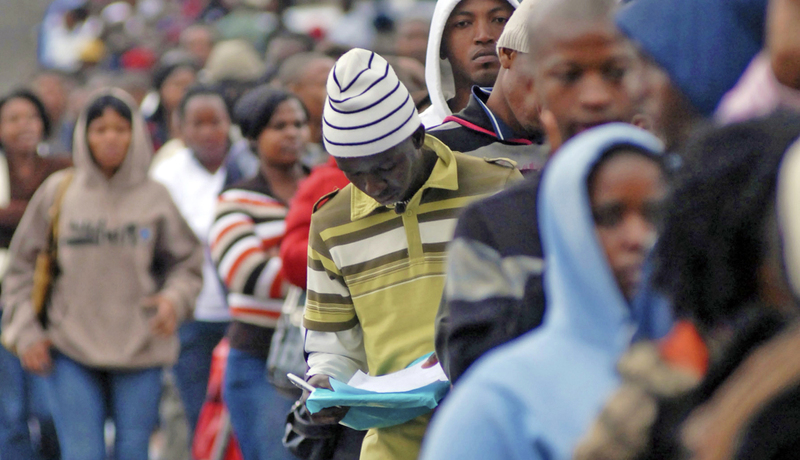 The ANC sought to build its hegemonic project on the promise of waged-labour. 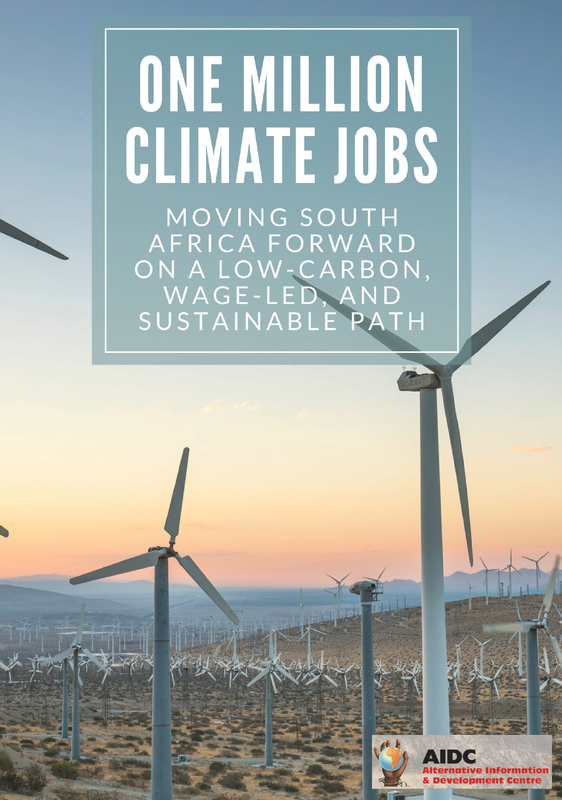 It is inevitable that this project began to unravel when it turned its guns, quite literally at Marikana, on workers struggling for a living wage. In the labour rebellion that ensued, capital has been occasioned not to review the political sensibility of its current position, but to call on the ANC to enforce the current system with ever-greater repression, and to be done with the unions ‘once and for all’. The South African ruling class is fighting for the preservation of cheap, docile labour inputs fed from a swelling reserve army for the same brutal Minerals-Energy based productive sector, now openly de-nationalised and interpenetrated with parasitic finance. It’s time for workers to have their own movement, their own party.